Tonight was a very special screening at UCLA, the 1958 Hallmark Hall of Fame TV production of the Cole Porter musical KISS ME, KATE. This terrific TV-movie was shown on the final evening of the Archive Television Treasures series. 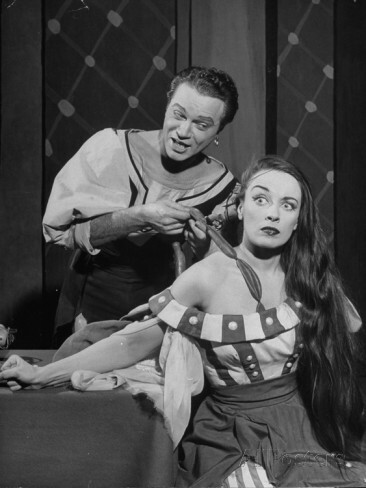 KISS ME, KATE, the tale of a battling divorced couple starring in a musical version of THE TAMING OF THE SHREW, was most notably a reunion for Alfred Drake and Patricia Morison. 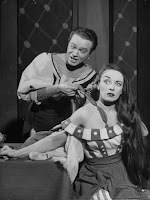 Drake and Morison had created the lead roles of Fred and Lilli in the original Broadway production of the musical a decade earlier, in 1948. Julie Wilson, who passed away in April, played the second female lead, Lois, with longtime DAYS OF OUR LIVES star Bill Hayes as Bill. The screening was introduced by esteemed musical historian Miles Kreuger, whose impressively detailed history of SHOW BOAT has been on my bookshelf for decades. He remembers seeing the original production of KISS ME, KATE on Broadway several times as a child! It was his favorite musical. Kreuger lamented, as I often have, that Broadway musicals were not preserved on film and that the performances were usually lost forever. The closest we can get to an original Broadway production is listening to a cast album or watching a show such as this Hallmark Hall of Fame special. Kreuger also introduced the wonderful Marsha Hunt, who was in the audience tonight, and shared that he spoke with Patricia Morison this week. Morison, who turned 100 in March, couldn't come to the screening as she had just returned from a trip to Palm Springs, but sent her regards. 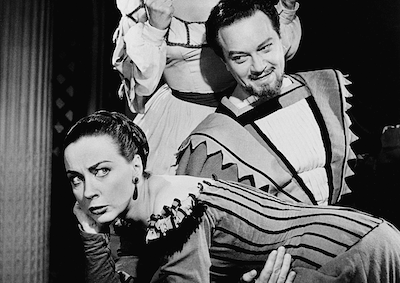 KISS ME, KATE was an abridged production, as it had to fit a 90-minute slot which also included breaks for Hallmark commercials. (The commercials were fascinating in and of themselves, a throwback to an earlier and perhaps more innocent time.) But as Kreuger said, don't focus on the songs which are missing from this production, but instead look at what we do have saved to enjoy...which is quite a lot! 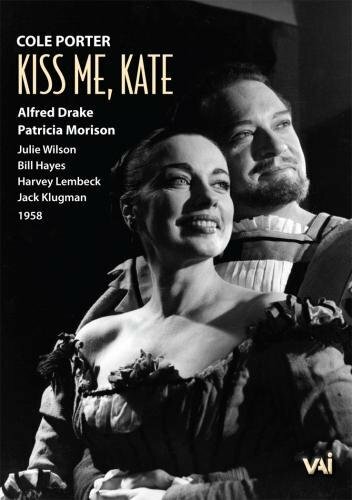 I own the original KISS ME, KATE Broadway cast recording on LP, but it was such a treat to actually see Alfred Drake and Patricia Morison visually as they performed the roles. Although I have a number of Drake's original Broadway cast recordings, including OKLAHOMA! and KISMET, this was probably the first time I'd seen him on a screen. I could certainly see why he was such a popular Broadway star, as beyond his voice, he was a charismatic and funny performer. I was particularly wowed by his sincere emoting during "So in Love." 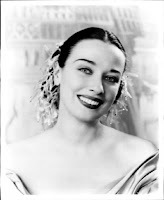 In recent months I have loved delving into Patricia Morison's work more deeply, over 40 years after seeing her on stage as the Baroness in THE SOUND OF MUSIC. In 2014 I was riveted by her performance in PERSONS IN HIDING (1939), and I also enjoyed her in THE ROUND-UP (1941) with Richard Dix. This spring I had the pleasure of seeing Morison in person at a screening of THE FALLEN SPARROW (1943), in which she played John Garfield's patrician ex-girlfriend. I've recently acquired a couple more of Morison's films, which I look forward to watching. Morison was such an interesting performer, with a self-confident attitude, a beautiful soprano singing voice, and her trademark long, dark hair. She had a fine career, including taking over the lead in THE KING AND I on Broadway when original cast member Gertrude Lawrence became ill, but one wishes there were even more of Morison on film to enjoy today! While I wasn't always completely simpatico with Julie Wilson's interpretation of Lois -- she made some odd vocal and physical moves I didn't care for -- she was for the most part okay, and Hayes was perfectly cast as Bill, though he could have used more screen time. The highlight for me, other than watching Drake and Morison, was Jack Klugman and Harvey Lembeck (just seen in BEACH PARTY) performing "Brush Up Your Shakespeare." They were perfectly cast as the genial gangsters who become fascinated with the theater, and I especially got a kick out of seeing Klugman in this role. The show was filmed in a kinescope-type process so it's not a perfect picture, but the viewer gets used to the "look" after a while, and it works. The "Wunderbar" scene is, at this writing, on YouTube; I think the print I saw this evening was better than what's seen there, with a sharper focus. KISS ME, KATE is available on DVD. Drake and Morison can also be heard in the original Broadway cast recording. The evening also included a showing of Janet Blair in a 1955 TV production of ONE TOUCH OF VENUS, but it's a work night for me and I needed to get on the freeway to head back home. ONE TOUCH OF VENUS, like KISS ME, KATE, is available on DVD. I expect to be back at UCLA Sunday to see TRACK OF THE CAT (1954) on the final night of the William Wellman series. What a solid gold treat! How I wish I could roll my Rs like Alfred Drake. WOW! What a treat this must have been. I would love to see this. Thanks for sharing the experience. 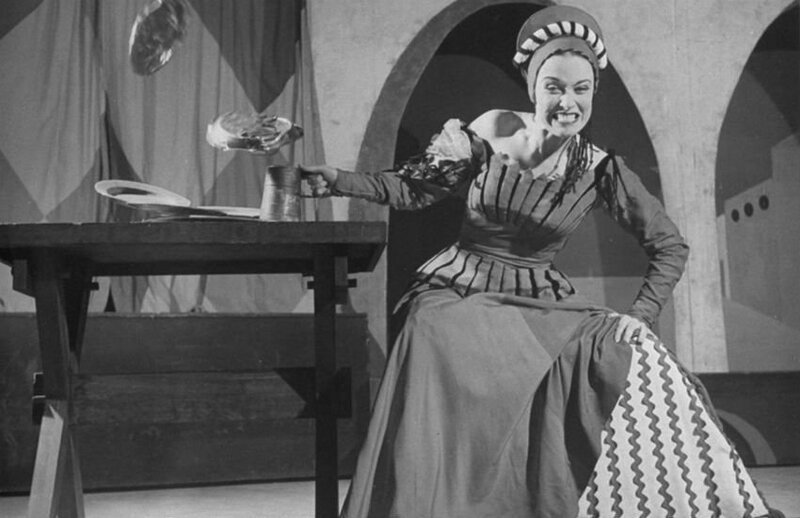 I love Kiss Me Kate and seeing the two original stars must have been a rare treat. I didn't know that Jack Klugman and Harvey Lembeck did the fabulous 'Brush up your Shakespeare' in this TV production. I can imagine they would be great. I wish that number with them would turn up on You Tube. Patricia Morison did another TV version of the show in 1964, with Howard Keel, for the opening of the BBC's second channel . I can just about remember it being so exciting. Though at that time I didn't know about Patricia's Hollywood career. Thanks to you all for your comments!! It really was such a treat seeing this, blown up on a big screen. Vienna, I would love to have seen Keel and Morison combined in a production, that must have been wonderful to see as well!!! Do you know if any recording of it survives? I found the IMDb listing for it here. I see Millicent Martin was in it also. I feel like maybe I saw her on stage in something years ago but am not sure -- maybe the RODGERS & HART review I saw in the late '70s? A postscript, my dad came up with the show I saw Millicent Martin in -- it was SIDE BY SIDE BY SONDHEIM with Larry Kert and Hermione Gingold, at the Huntington Hartford Theatre (now called the Montalban) in 1978.